The Coronet shall determine and create such awards as they wish to bestow. Per Corpora VIII.B.4, such awards must be ratified by the Laurel Sovereign of Arms. The precedence of these awards shall be determined by the Crown of An Tir. This is a closed order consisting of all those who held the position of Defender or Lady of the Summits prior to the Crown Principality of the Summits being granted full status as the Principality of the Summits. Members may wear a black garter with a grail tippet. Members of the order are those combatants who have placed second in the Coronet List. Members may wear an argent sword bent into a ring. Member of the order are the cosorts of combatants who have placed second in the Coronet List. Recipients may wear an argent rose wrapped around a spear. Bestowed by the current Princess to that combatant whom she judges to have been most chivalrous during the Coronet Lists. The recipient shall bear the Shield of the Summits and display the favor of the Shield of the Summits. The consort of the recipient shall bear the Baldric of the Shield of the Summits and carry the Most Honourable List of the names of those combatants and consorts who were previously bestowed this great honour. A new member of the Order is selected at each Coronet List and the regalia is passed-on. This award is bestowed to honour those who make extraordinary contributions to the principality and emulate the ideals and embody the essence of the Principality of the Summits, the Kingdom of An Tir and the Laurel Kingdoms. This is a polling order and is given with the recommendation of the current Companions of the Order. The honour shall be bestowed no more than once per Coronet reign and need not be given every reign. The Coronet shall only present this award at Principality Level Events at which the recipient is present. This award is presented as a sign of appreciation and honor by the Coronet Consort to select gentles who have contributed greatly to the personal care and well-being of Her Highness. Recipients are entitled to wear the Symbol of the Order, an Argent spray of Barberry. This award is given as a sign of appreciation and honor by the Coronet Sovereign to select gentles who have contributed greatly to the personal care and well-being of His Highness. This token is designed by each Coronet Sovereign. This award is bestowed by the Coronet for notable contributions to the Arts and Sciences (Vert ). Due to the varied nature of the award, a recipient may receive more than one of the same or different types of grails. This award is bestowed by the Coronet for notable contributions to the Service (Gules). Due to the varied nature of the award, a recipient may receive more than one of the same or different types of grails. This award is bestowed by the Coronet for notable contributions to the Martial (Sable). Due to the varied nature of the award, a recipient may receive more than one of the same or different types of grails. This award is bestowed upon to those good gentles who reside within and without the borders of the Principality of the Summits and who make grande and notable contributions to the Principality of the Summits and/or the Coronet of the Summits. The token for this award is determined by each Coronet. Given to those who reside outside the borders of the Principality of the Summits and who make great and note-worthy contributions in support of the Principality. Recipients are entitled to wear the Symbol of the Award, an Argent grail on an Azure field. This award is bestowed upon combatants to recognize their extreme fighting prowess and undeterred ferocity on the field of battle. Created during the reign of Brogan O'Bryant the Bull and Johanna Kjoppmanndtr, June AS XLIV - Dec AS XLIV. Given to recognize those subjects of the Principality of the Summits who travel far and wide throughout the lands of the Known World and represent the Summits with honour and diplomacy. This award acknowledges those merchants who make outstanding and on-going contributions for the enrichment of the Principality of the Summits and/or the Coronet of the Summits. 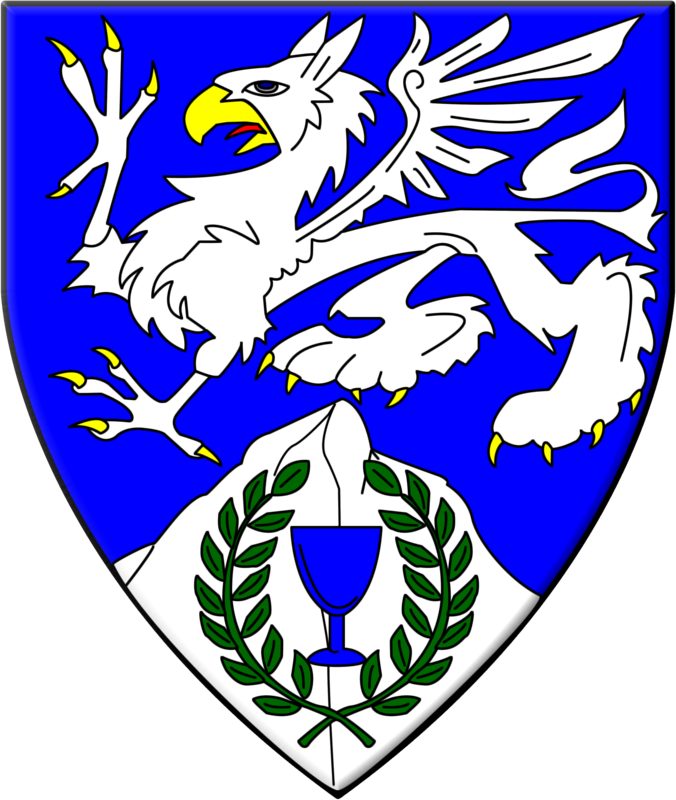 The token for this award is (Fieldless) A chalice Azure, five bezants in annulo. (translates to The Order of the Golden Stars, formerly Aurum Astra) Bestowed upon children (generally 5-11 years of age) who are deserving of reward for their contributions to the Principality of the Summits. Accolade bestowed upon an individual who, despite overwhelming odds, pursues and displays thoughts, words and deeds that are inspirational to the Coronet and Populace of the Principality of the Summits. This is a polling order and Companions in this Order will offer a candidate for consideration to the Coronet, before an invitation is offered to a new companion. The honour shall be bestowed no more than once per Coronet reign and need not be given every reign. The Coronet shall only present this award at Principality Level Events at which the recipient is present. The scroll and token for this Order is made by fellow Companions. The token consist of an Argent Gryphon's Wing. Created during the reign of Brian of Ledbury and Acacia Gryffyn, Dec AS XLIII - June AS XLIV. Bestowed upon those who, through self-less acts of kindness and service bring joy and happiness to the presence of the Coronet. Recipients may wear a circlet as created for them by each Coronet. Created during the reign of Abu Nur Rustam Ibn Abdallah and Suvia filia Hereberti, Dec AS XLIV - June AS XLV. Recognition for excellence in research, alchemy, astronomy or any other sciences. Is bestowed by the Coronet upon an individual's successful completion of a term as Defender of the Summits, either by holding the position until the next Defender's Tournament or by ascending to the throne during their tenure as defender. Offered by the Coronet to those who display outstanding efforts in support of the Coronet during their reign. Recipients may wear a circlet as created for them by each Coronet. Is bestowed by the Coronet upon an individual's successful completion of a term as Alpine Scholar (A & S Champion). Is bestowed by the Coronet upon an individual's successful completion of a term as Captain of Cats (Champion of Rapier Combat). Is bestowed by the Coronet upon an individual's successful completion of a term as Captain of Eagles (Archery Champion). Is bestowed by the Coronet upon an individual's successful completion of a term as Outrider of the Summits (Equestrian Champion). Is bestowed by the Coronet upon an individual's successful completion of a term as Bardic Champion. This award is given by the Coronet of the Summits at Their pleasure to those gentles who inspire their fighter to reach greater heights.